It hardly seems a criticism, but the problem with much of director Federico Fellini’s output is that it is too entertaining to take it with the seriousness that it deserves. Take Amarcord as a key example; from the outset what we have is a wildly funny look at Italian small town life, replete with bawdy humour, sequences of pure slapstick, and a lightness of tone which fools the viewer into thinking that it is merely a simple pastiche of everyday life beside the Adriatic. One of the clues to the film’s meaning is in the title; Amarcord is an approximation of ‘I remember’ in the dialect of Fellini’s hometown of Rimini, and what is clearly being portrayed here is the small seaside town of his childhood. Much, but not all, of what we see is filtered through the eyes of a group of pubescent boys: the boring lessons at school, the buxom women whose derrieres populate their gazes, the coming and going of the seasons over the course of the year. But this is not pure bildungsroman, as from the outset there are competing narrative perspectives: the opening sees the town idiot explaining to us the significance of the spring puffballs, and the town’s lawyer regularly intercedes with pieces to the camera detailing facts and fancies about the locale. Fellini’s later films were frequently criticized for the exaggerations and indulgences which were seen to be the antithesis of the pared-back Italian Neorealist school in which he cut his cinematic teeth. It must be remembered, however, that, like that more recent over-the-top documentor of the grotesque Terry Gilliam, Fellini came from a background of cartoon-making, and this instinct for caricature provides an interesting, if not entirely surprising, insight into his filmmaking mindset. 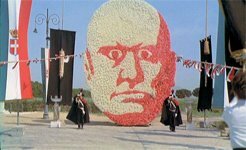 Take the gruesomely comical visage of Mussolini that is paraded before the assembled Fascist parade – the contrast between its ridiculousness and the later scene where a Communist sympathiser is forced to drink castor oil flags up the duality between the absurd and the serious which runs throughout the director’s work. Another accusation lazily thrown at Fellini is that his films are sexist – the superficiality of the women of La Dolce Vita (1960) and 8 1/2 (1963), coupled with a consistent voyeuristic obsession with the female form has fed into these claims. The fact is, if women don’t come off too well in some of his films, frankly neither do the men. Marcello in La Dolce Vita is equally as shallow as his female counterparts, and the famous harem scene is suitably avenged in his later La Città delle donne (1980). The women of Amarcord present an equally curious mix, representing different aspects of sexuality, both public and private. The promiscuous Volpina is in stark contrast to the class of town beauty Gradisca, as underlined by their colour coded uniforms (Volpina’s green dress the opposite of Gradisca’s bright red coat). Yet the former’s is a more honest sexuality, while the purity of the latter is questioned when she is offered up as bait for a visiting Fascist official. The undercurrent of Fascism underlines one of the film’s other important strands: that of the disparity between the public and private, the indoor and the outdoor. While the town puts on a face of community and civic pride with its rituals, such as the burning of the witch of winter, or the daily passeggiata through the town square, behaviour inside the town’s buildings is far from harmonious: the arguments, sexual intrigues, political discontents all play out behind closed doors. When Uncle Teo is released from the insane asylum for a day out in the countryside, the worst he does is climb a tree and proclaim “I want a woman!” – an honest cry of frustration, but enough to demand incarceration. All is about appearance and superficial calm – as Fellini embodies with the grand but clearly artificial SS Rex ship passing by the town. It is this unwillingness to publicly admit discontent which allows good people to submit to Fascism. Amarcord is a dense, thematically complex film, yet it all seems to hang together effortlessly. Of course, this is evidence of a true directorial master at work, but no mention of Il Maestro can go without flagging up the immeasurable contribution that his own maestro, Nino Rota, made to his work. It is often said that Fellini’s films make no sense without Rota’s scores keeping them going, and with Amarcord their collaboration’s synthesis of image and music is at is very peak: the opening theme with its melody which gently falls before soaring again still higher perfectly evokes much of the imagery of the sea, and the puffballs of the opening shots. The theme later recurs in many different forms: a romantic Hollywood-style theme, an upbeat lounge-jazz version, and one absolutely magical slower syncopated variant accompanying the boys’ glide through the snow-covered town square. Along the way, there is also polka, flamenco, accordions and even Arabian-influenced sounds. An astonishing array of sounds, yet entirely coherent, and testament to the true genius of Nino Rota.